Julian Assange is still in the Ecudorian Embassy in London, where he has been holed since 2012. What brought Assange into my mind was a visit to London middle of September, and a news report in the Daily Mail about the Metropolitan Police and the cost of watching over the journalist. 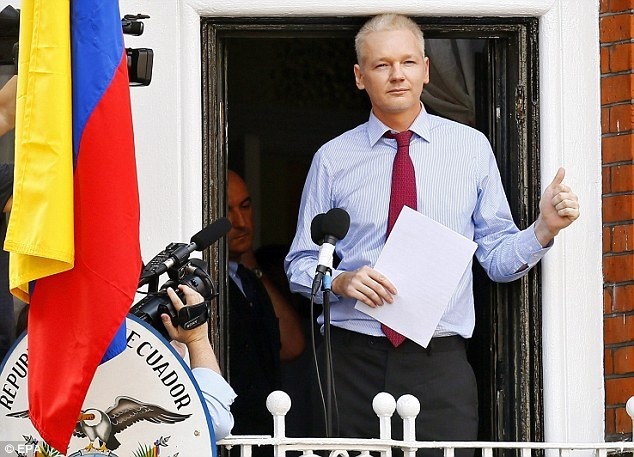 We all know Assange has been holed up in the Ecudorian Embassy following his refusal to hand himself over to the Swedish authorities concerning a case with two Swedish women. But what made an onlooker like me laughed was the request by the authorities in London seeking who to share the cost of the burden of keeping Assange holed up in the embassy. Did anyone force the British authorities to have their police officers maintain a round the clock watch over the embassy, all because of ensuring Assange does not escape? Why hasn't the British authorities turn to Sweden to ask for possibility of sharing the cost of policing Assange in the embassy? According to laughable report in the mail, it has cost the British tax payers nine million pounds to keep watch over the embassy doors because of Assange since 2012, when the Metropolitan Police have been standing outside the building,day and night. Formally, Assange has not been sentenced to any form of imprisonment by the British authorities,because he has not been tried and found guilty by a court of law. But informally, he has been imprisoned by the British authorities for making it impossible for him to come out of the embassy to avoid arrest. Reports said that Assange uses two rooms in the embassy where he is holed: One room for sleeping and another for working. He is in London and at same time in Ecuador, because the Ecuador Embassy in London represents Ecuador as a country. And the British authorities don't want Assange to escape to Ecuador away from London. Imagine living in a building for three years without stepping out of the doors. What does that connote? Is it not imprisonment? Is the difference between it and a formal imprisonment not just that a person formally imprisoned has been tried in a court of law and he or she is a in a prison yard, while in the case of a man or woman who has been denied his or her freedom is in a building unmarked as a prison, but informally he or she has no freedom to walk around with liberty. Politically, there are instances when people are put under the house arrest, watched over by the law enforcement and cannot leave the building. All is still about the loss of liberty and freedom. It doesn't appear that Assange can freely communicate with people in or outside the embassy for the fear of getting bugged. Perhaps he can communicate with people, but avoid discussion of sensitive issues, because in 2013, there were reports of a hidden microphone the Ecudorian officials said they discovered in the embassy, and they accused British authorities of an attempt to bug Assange. No one knows when Assange would regain his freedom to live a normal life. The last time the Swedish authorities came near questioning Assange in his hole in the embassy in March 2015, but that did not go through for reasons of bureaucracy, because there was a need for clearance from the British authorities and the Ecudorian authorities. But meanwhile, Assange's fate remains in the balance. British people will continue wasting precious amount that can be used to provide amenities for the poor, and or possibly take in some asylum seekers.